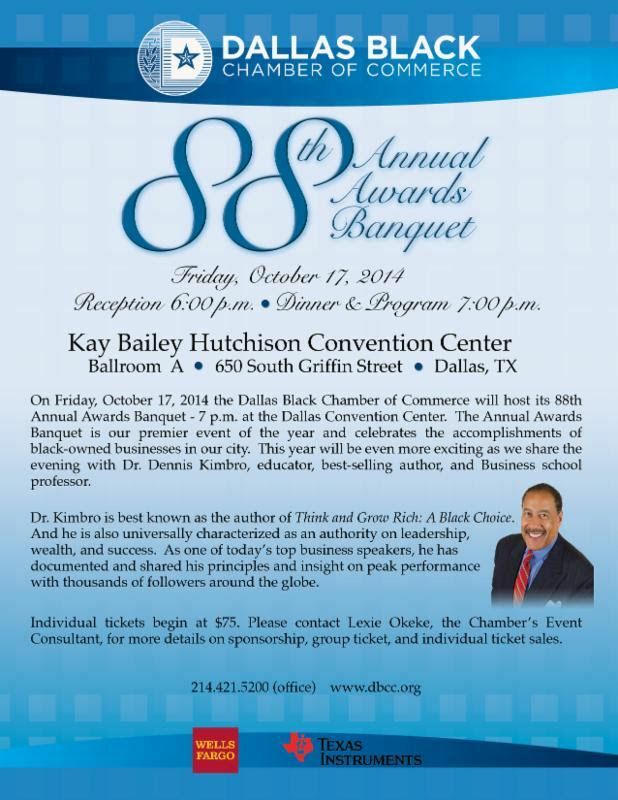 The Dallas Black Chamber of Commerce will host the 88th Annual Awards Banquet, Friday, October 17th, 2014 at the Kay Bailey Hutchinson Convention Center, 650 South Griffin Street, Dallas, Texas, Reception 6:00 p.m. – Dinner & Program 7:00 p.m.
DALLAS - Oct. 7, 2014 - PRLog -- The 88th Annual Awards Banquet serves at the premier event of the year for the Dallas Black Chamber of Commerce and celebrates the accomplishments of black-owned businesses in Dallas County. This year the Dallas Black Chamber of Commerce will be even more exciting as we share the evening with Keynote Speaker Dr. Dennis Kimbro (http://www.denniskimbro.com/), Author of Think and Grow Rich: A Black Choice, sponsored by Wells Fargo and Texas Instruments. A tireless educator, author, and B-school professor, Dr. Kimbro is universally characterized as one of the most insightful and scholarly writers in the field today. As a lecturer and researcher in the field of management, entrepreneurship and human potential, he encourages his readers to look within to extract the keys that underlie all accomplishment. He received his B.A. and M.A. degrees from the University of Oklahoma, and a doctorate from Northwestern University where he studied wealth and poverty among underdeveloped countries. With his course work behind him, Dr. Kimbro combed the country interviewing scores of America’s most notable achievers. Achieve PR President/CEO DeNita Lacking-Quinn named Dallas Business Journal's "40 Under 40"